As a fan of Matthew Bomer's character Bryce on NBC series Chuck, I begged the TV gods to give Bomer his own show. Ask and ye shall receive. USA has picked up the new series White Collar, starring Bomer as Neal Caffrey, a con artist who plays cat and mouse with the FBI before finally getting caught. Faced with a long sentence, Caffrey gets an offer from his nemesis, FBI agent Peter Stokes (Tim DeKay), to work with the Feds apprehending similarly elusive criminals. It sounds like a fun premise, and gives Bomer a chance to do the charming rogue role he played so well on Chuck. Check out a video preview at the USA White Collar website. DeKay's a longstanding character actor with a resume full of of guest spots on top-notch TV, and should be good as the straight arrow G-man. I'm not as sure about 90210 alum Tiffani Thiessen (who dropped the "Amber" from her name somewhere along the line), but I'm reserving judgement until I see her in action. Michael Gaston and Diahann Carroll also make the cast list. We'll have to wait until the fall season to see how White Collar plays out, but I'm hoping it'll be good enough to keep Matthew Bomer on our TV screens. 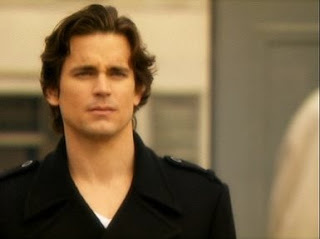 PHOTO: Matthew Bomer as Neal Caffrey, White Collar screencap, c2009 20th Century Fox Film Corp., USA network.